EconEdLink - Who Bears the Burden When a Tax Is Imposed on a Good? Who Bears the Burden When a Tax Is Imposed on a Good? Students will learn how to determine the function values [f(x) or y values] of simple functions by calculation and inspection and will learn to calculate the area under straight line graphs. Students will watch a video to learn that a tax imposed on the producer and/or consumer of a good has an effect on both. Students will use an interactive slide show to determine the tax burden on producers and consumers. 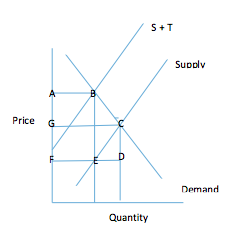 Students need to have knowledge of supply and demand, equilibrium price and quantity, determinants of demand and supply as well as producer and consumer surplus. Determine the value of a function when given the x value. Apply mathematical knowledge of functions to an economic example. Determine the value of a function at a given x value from a graph. Determine the area under straight line graphs. Determine the dead weight loss as well as the portion of tax paid by the producer and consumer using different graphs. Determine whether a given event causes a shift in supply or demand. Which of the following markets will experience a “dead weight loss”? You are the newly appointed Head Economist of Super Health Food Industries. Your first task is to evaluate the present situation regarding the supply and demand of one of the company’s most popular products: The X-Factor Apple Sauce. Presently the price is $3 per bottle of 330 ml and five million bottles are sold per month. Use the given Supply and Demand curves. Label the axis and the curves and clearly indicate the price and quantity at equilibrium. Due to a storm, the apple crop is much less than during the previous season. This means that the company will not be able to supply five million bottles per month. How will this affect the market? Also, indicate the change on the next graph. Price will rise, quantity exchanged with fall. The government decides to tax the producer of the sauce at $3 per bottle. Use the following graph to calculate the producer and consumer tax burdens and the dead weight loss. Answer: producer tax burden: 2 million bottles x $1 = $2 million. ½ x (1 million) x $1 = $1/2 million. The producers’ incidence of this tax is $1 per bottle. Consumer tax burden: 2 million bottles x $2 = $4 million. ½ x (1 million) x$2 = $1 million. Consumers’ incidence of this tax is $2 per bottle. The consumers effectively pay $2 of this tax and the producers effectively pay $1 of the tax per bottle. Dead weight loss: ½ x $3 x 1 million bottles: $ 1 ½ million. Ask students to solve for the values of x and y and show their calculations in the table below. A government may tax a good or service in order to generate revenue. This will result in smaller producer and consumer surpluses and in dead weight loss. The tax burden is carried by the producer and consumer and can be calculated using different areas on the supply-demand graph for the good or service. Mathematical straight line functions are used to calculate the corresponding price(s), (the y-value), asked and/or paid for a given quantity of a product, (the x-value). Equations to calculate the areas of rectangles and triangles are used to calculate different areas on the supply-demand graph. Write a simple equation such as y = 2x + 4 on the board. Write the following steps on the board, explaining the method. Distribute a copy of Activity 1: Calculate Function Values to each student. Ask students to study the information on mapping in number 1. Divide the students into pairs and ask them to use the given example to answer number 2a-2c on Activity 1. Review answers. Ask students to calculate the value of y in each example and complete the table in number 4 of Activity 1. After students have had time to work, draw the table on the board and with student input, complete the table, explaining the process in all three cases. Allow each student to mark and/or correct his/her own answers. Why is 4(0) = 0? Why is 4(-1) = -4? Multiplying a negative number by a positive number always gives a negative answer. Why is -4-3 = -7? Adding 2 negative numbers will always give a negative answer. Ask students to study the examples in number 5a and 5b in Activity 1. Allow students to practice calculating the y-value in 6a and 6b either individually or in pairs. Ask two students to do the calculations on the board while the rest of the class identifies possible mistakes or evaluates the answers. Distribute Activity 2. Calculate Areas, one copy per student. Ask students to only calculate the areas of a triangle and rectangle in this lesson. Instruct students to use the appropriate formula to complete Activity 2. Review student work. Use Slides 1-7 to review demand, determinants of demand, supply, and determinants of supply. Use guided practice to allow students individually to calculate the prices and quantities in numbers 1 and 2 of Activity 3. Ask students to share their answers and explain their reasoning. A scenario will be displayed on a slide. This scenario will influence the supply and/or the demand curve. You must choose the card (A-D) that depicts the correct shift(s) of the curve(s) as well as the card (E-H) that shows the change in the equilibrium price and quantity. When asked you must show the two cards by raising them above your head. Show Slide 9 and encourage students to discuss and reason with a friend to determine the correct cards. Students ask pairs to raise their cards and assess by looking at the colors of the cards or the letters in the upper left corner of the card as indicated in the table below. Explain the reasoning to ensure understanding. Show Slides 10-12 and allow students to decide which cards to show. Assess the correctness of the responses by observing the colors or the letters of the cards as indicated below. Give the correct answers and explain the reasoning. Price of the toys will decrease and the quantity exchanged will decrease. Change in taste and preferences. Change in cost of production. Change in the price of a complementary good. Household gas can be used in place of coal. If the price of coal increases, less coal and more gas will be bought. The demand for gas will increase—the demand curve will shift to the right—price of gas will increase, quantity will increase. Change in the price of a substitute. It is easier and cheaper to trap crabs. The supply of crabs will increase—more crab meat can be canned—the supply of canned crab meat will increase—the supply curve will shift to the right—price will decrease and quantity will increase. Change in the cost of production. Distribute Activity 5, Taxation and Dead Weight Loss, one copy per student. Tell students that they will watch a video that explains the effect of a tax imposed on burgers and that they will record some information on Activity 5. Ask them to pay careful attention to the terms "consumer surplus," "producer surplus," and "dead weight loss," which are introduced in the video. Tell students you will pause the video for them to be able to record the information. Continue the video and pause the video at 4:50. Ask students what will happen to the supply curve if hamburgers are taxed. [Supply will decrease and the curve will shift to the left.] 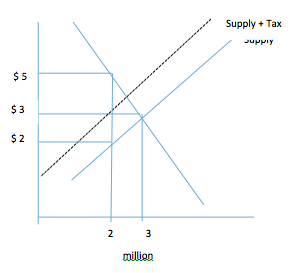 Tell the students to draw a “new” supply curve where tax is included. Draw a supply + tax curve on the graph on the board. See the graph in step 24. Students mark or rectify their own work. Continue the video and pause the video at 6:22. Tell the students to, in a group of four, discuss and then write down their understanding of “dead weight loss” in number 4 of Activity 5. Each student must also color the dead weight loss on their graphs. Ask groups to define dead weight loss. [Dead weight loss is inefficiency created in a market. 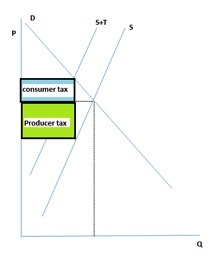 It is the part of consumer and producer surplus that is lost because of taxation. The most common reason for dead weight loss is government actions such as taxes or supply controls. 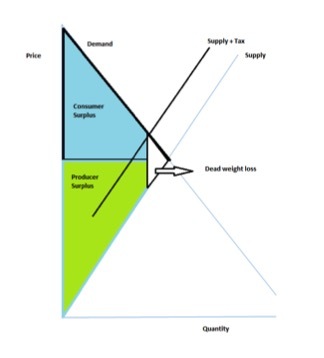 Dead weight loss is often illustrated by the use of a diagram that depicts a triangle formed by the demand curve above and the supply curve below and the quantity.] For more background read more: www.businessdictionary.com/definition/deadweight-loss.html#ixzz3L4NKm4BX Color or mark the dead weight loss on the graph on the board. See answer below. Draw a graph as in procedure step 24 on the board and explain the tax incidence or the division of a tax burden between buyers and sellers. Stress that the amount of tax paid can be determined by calculating the area of the rectangle in each case. 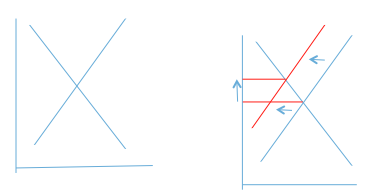 Tell students to draw the rectangles to determine the tax incidence in 7A, 7B and 7C in Activity 5. They must also indicate who will bear the bigger tax burden in each case. Draw the graphs on the board as below and allow students to mark their own work. In this case, the consumer will bear a larger part of the tax burden. Download the slide show “Tax Incidence” from www.stlouisfed.org/education_resources/tax-incidence/ and store as a Notebook file. 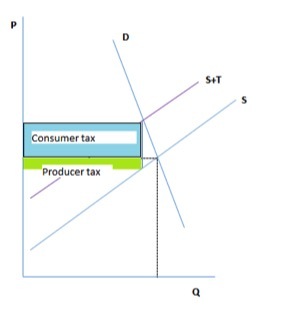 Tell students that they will be using interactive slides to calculate the consumer and producer tax burdens or tax incidence and the dead weight loss. Students will only use slides 2-15 during this activity.